Do you remember the last time you were on Cloud 9? 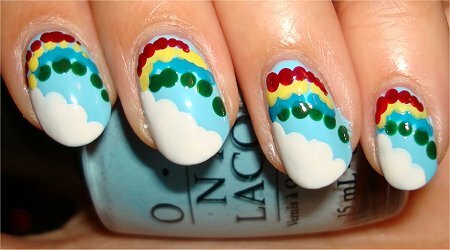 I was on Cloud 10 with these Rainbow & Cloud Nails. Did them many weeks ago, but I’m only posting it now. It’s been a few days since my last nail post, so it’s about time! You may remember me sharing my Dotty Nails that I did when I was just playing around with my new dotting tools. This manicure was done perhaps a few days after that one. 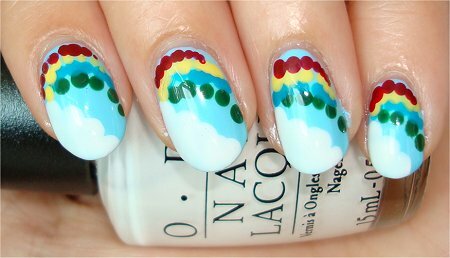 I always wanted to try my hand at rainbow nails, but i thought my hands would be too shaky to draw smooth arcs for each colour. Using a dotting tool is very easy and the way the dots come out in various sizes depending on the tip and how much pressure you apply makes the end result more interesting to me than perfect arcs anyway. 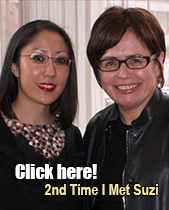 Hope you try this and share with me any of your dotty manicures! It’s cool when you can design a picture using just dots. I’d love to see what you can come up with! 2 coats of OPI What’s with the Cattitude? I went with OPI What’s with the Cattitude? because it’s such a fresh, bright sky blue. 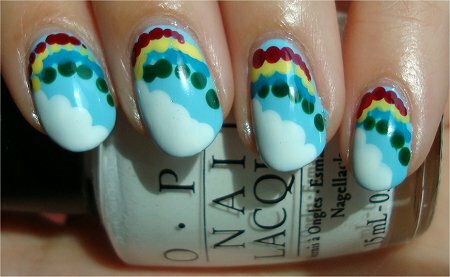 Looks so cheery on my nails, and it’s easy to work with. Wait about 8 minutes or so to let it dry a bit before continuing. 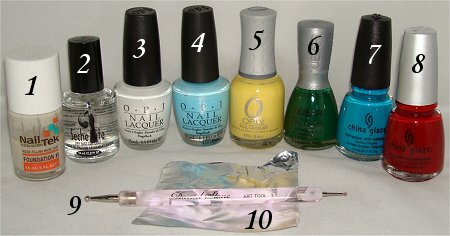 To see more swatches & a review of this polish, click the above link. Add some white polish to your piece of foil. (I used OPI Alpine Snow, which is a standard white creme.) 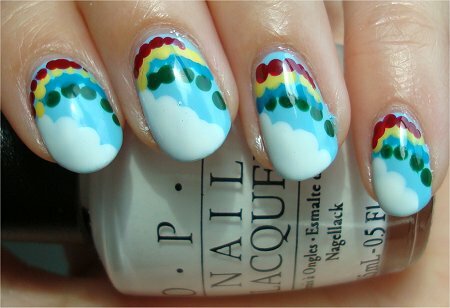 Then, dip your dotting tool into it and dot on your clouds. You want to make your clouds as fluffy as possible. I think it gives it that cute cartoonish feel. 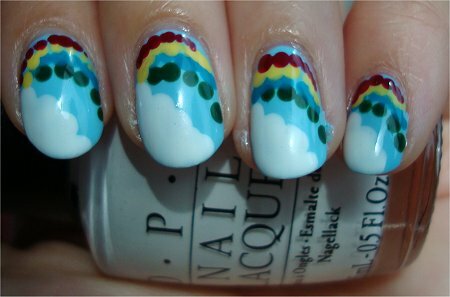 I decided to put the clouds on an angle near the tips of my nails, but you can put them anywhere you think looks best. 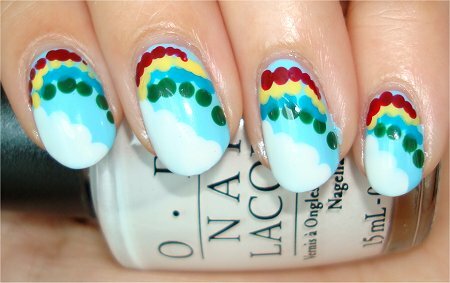 Maybe put the clouds near the cuticles? 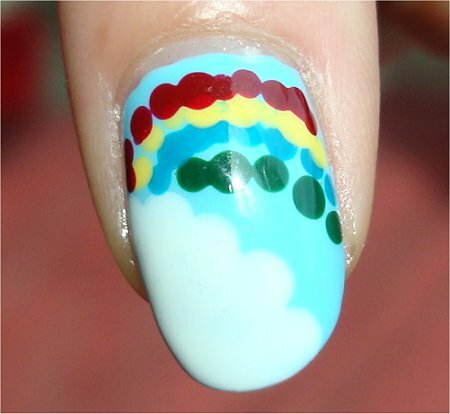 Then you can make the rainbow like an upside-down U near the tips of your nails! There are so many possibilities. Add a bit of polish for your first coloured arc to your piece of foil and then dip your dotting tool in it. 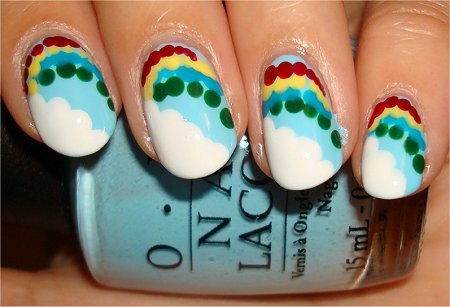 Dot a curved line onto each nail. Don’t worry about having exact spacing between the dots. 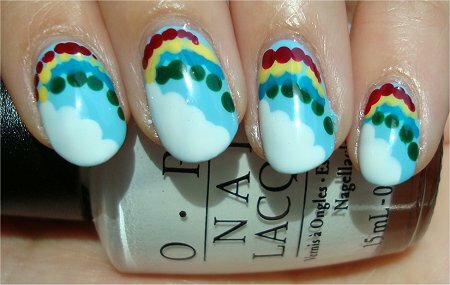 Nail art doesn’t have to be perfect – it just has to make you happy! Besides, when you’ve added all of the arcs, it’ll even out and you won’t really pay attention to any goof-ups. Don’t worry about overlapping or any sloppiness. When you’re done applying all the colours you want, make sure to wait a good 10-15 minutes before continuing or you may risk streaking your design. 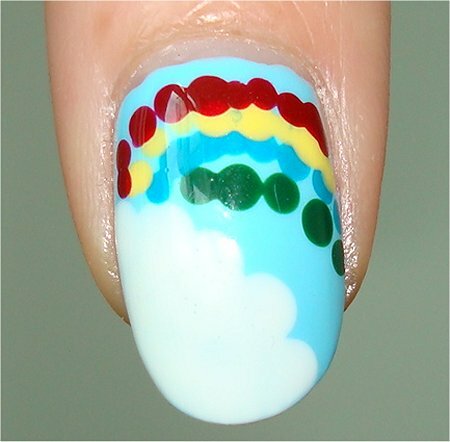 Pot of Gold: If you’re feeling really adventurous, you might want to paint on a large pot of gold on your thumb nail. All you’d need is a black polish and a gold polish. Paint on a large circle for the pot and then put a heaping pile of yellow dots on top. Then go over the yellow dots and highlight them with gold polish to make the treasure come alive! Mr. Golden Sun: Instead of a rainbow and cloud, you could paint a sun with all its rays shining down on your ring finger or your thumbnail. I think that would be cute. You could even give him sunglasses. 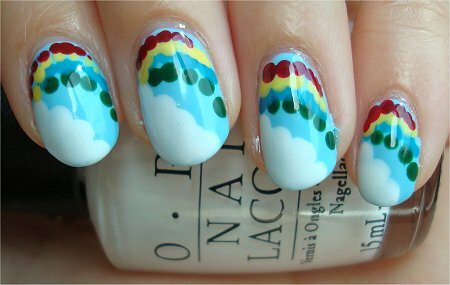 Have you ever tried rainbow nail art? What’s your favourite colour? Did you used to watch Rainbow Brite when you were a kid? 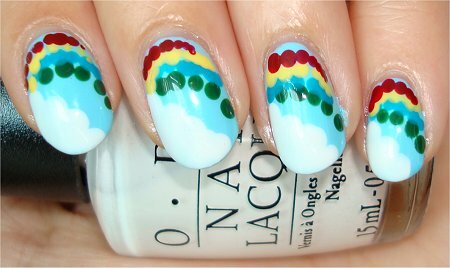 This entry was posted in Nail Art, Nail Polish Swatches & Reviews, Product Reviews, Tutorials & Tips and tagged China Glaze, Daniel Stone, Nubar, OPI, Orly on September 27, 2011 by Mary S..
It’s cool that you tried rainbow nail art. Did you paint on an actual rainbow or did you use rainbow colours? Definitely you should try it again! 🙂 I’m pretty new to using so many dots for a design. The thing that’s good about this rainbow design is that precision isn’t as important, so you can really just have fun with it. Hope you try this. 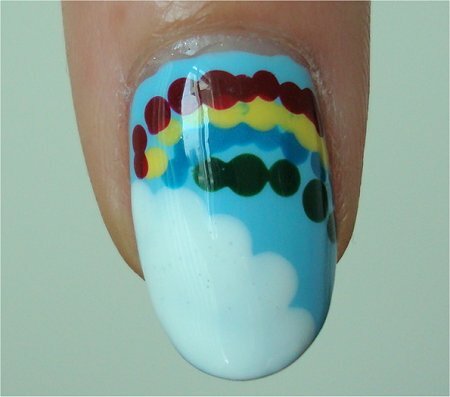 I’d love to see it on your nails. You have such nice nails! Hahaha, I’m sure Mr. Leprechaun would oblige! He’d be the snazziest leprechaun for miles! Or he would probably want to sport gold nails. You know hos fixated they are with gold..
I’d want a unicorn with a rainbow mane (like the kind Starlite from Rainbow Brite had). Hehe, yeah, he might want gold and not just in colour, but 24 carats. Love this! I’ve always wanted OPI What’s With The Cattitude but never got my hands on it! Haha, I’ve wanted that blue for a looooong time. Funny thing is that when I decided to get it, it was sold out everywhere I went, so I had to resort to eBay. Thankfully, I basically paid around the retail price, so I didn’t feel like my wallet was burned. If you’re able to get your hands on it, I highly recommend you do! 🙂 If you can’t, China Glaze Bahamian Escape may be the next best thing. It might not be a dead-on dupe, but it’s close enough. So awesome!!! What’s With the Cat-titude is the perfect sky blue for this manicure. I also love how you did dots instead of just solid arcs. It’s cute! Glad you liked the dotted arcs. They were much easier to do, so that was a bonus! You’re so welcome! 🙂 You raised a good point about “McDonald’s Fashion”. I’m surprised that more people haven’t commented on it, actually. So pretty! 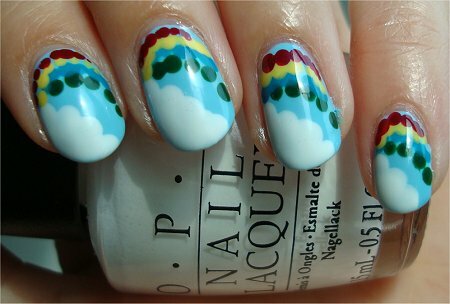 I always love your nail art! Thank you so much! 🙂 I enjoy sharing them with you! Now that you mention it, you’re right – I totally see children’s wallpaper! Haha! SO freaking adorable! 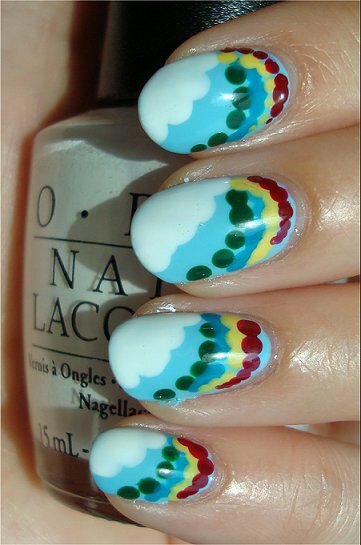 I love how you used a dotting tool to make your rainbow! I am going to save this for later! imfeelingnail-venturous recently posted: GUEST POST: Featuring Kelly from KellsDIYnails on Facebook! You should definitely try this out! 🙂 Dotting on the rainbow is waaaay easier and waaaay faster than drawing on the stripes. 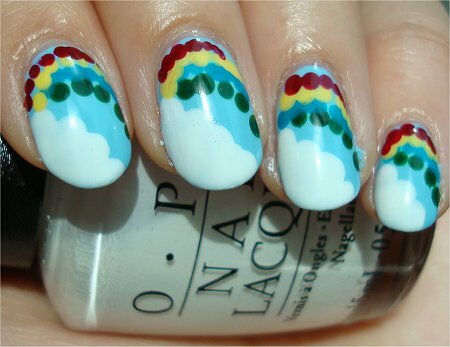 I wish i know how to color my nails like that. I have always been spending money on parlors everytime there is party. I am never good with art but i want to learn and design my nails myself. 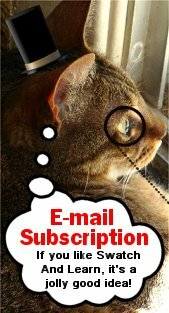 You can definitely save a lot of money doing it yourself. 🙂 Oftentimes you just need to try it and you’ll be amazed that you can do it. Hehe, I’m glad that this design makes you happy. It made me happy, too. 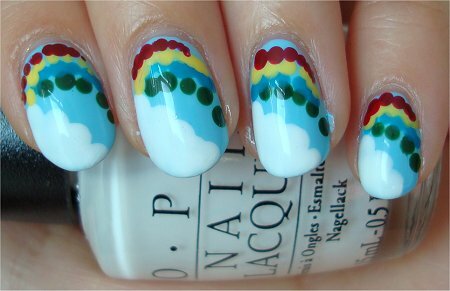 Every time I’d look down at my nails, I’d see blue skies, fluffy white clouds, and a rainbow! It would be nice if I saw that more often when I look outside my window.